Review your credit report and, if necessary, fix errors. You are entitled to one free credit report from each credit reporting company per year at Annual Credit Report. It is important to check for reporting errors that could be negatively affecting your score. If you find an error, contact the company reporting the information and the credit reporting company to challenge the report. Common errors include closed accounts showing as open, incorrect balances or limits and accounts opened by someone else due to identity fraud. Pay off your credit card each month. By making purchases on a credit card and paying the entire balance each period, you are developing a positive credit history and displaying sound financial management skills. This will increase your credit score. To meet this goal you will need to keep your spending under control. 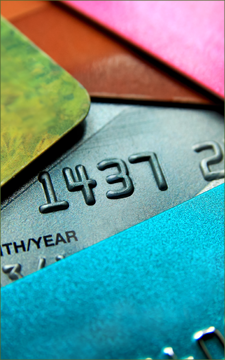 If you are unable to pay off the card, you will start to accumulate revolving debt that will hurt your credit score. Make your payments on time. Late payments, even by one day, can be one of the most damaging hits to your score. If possible, set up automatic payments for as many bills as possible to lower the risk of forgetting to make a payment. The longer your history of paying on time, the more your score will improve. Pay down your debt. Another large chunk of your credit score is calculated based on the amount of debt outstanding. Mortgage lenders specifically use a debt-to-income ratio to determine loan eligibility. In addition to the amount of debt you have, you also need to pay attention to the debt limits you have on your accounts. The closer your debt is to the limit, the worse your score will be. Don't allow an account to go to collection. Collections will stay on your credit report for seven years! Avoid having any of your accounts go to collections if at all possible. Medical bills and other one-time expenses are often the types of accounts that find themselves in collections. If you are unable to pay a bill in full by the due date, call the company and see if they have payment plans or other programs to get the bill paid without going to a collection company. Should you wish to review your situation please feel free to call. Also feel free to forward this newsletter to someone who may benefit from this information.